Quantity: 18 available Want more than 18? Cardfight Vanguard: The Galaxy Star Gate boosters feature only clans from the Star Gate nation! Players can construct Dimension Police and Nova Grappler decks with cards from just this set. 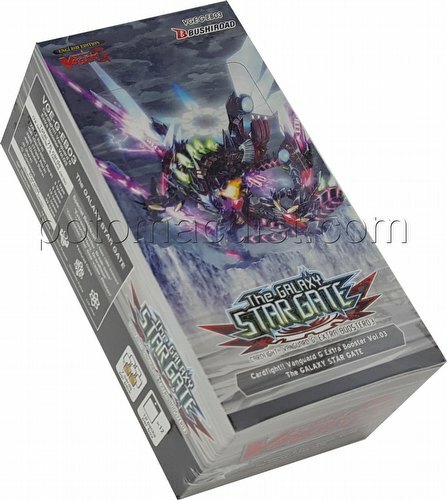 The Galaxy Star Gate boosters also feature Link Joker power up cards for the Rondeau of Chaos and Salvation booster set and Messiah Dragon of Rebirth trial decks. The Zeroth Dragon from Star Gate finally descends!! There are 76 cards in the set (72 new cards and 4 reissued cards) - 1 ZR, 3 GR, 6 RRR, 12 RR, 21 R, and 33 C, plus 12 SP Parallels and 3 Special Reissues. Two cards in every pack will be Rare or better. The 4 noremal reissued cards include "Extreme Battler, Sever-temper", "Extreme Battler, Arashid", "Cosmic Hero, Grandrope", and "Biting Deletor, Geeva". Reissued RRR cards include "Extreme Battler, Break-pass", "Cosmic Hero, Grandbeat", and "Companion Star Star-vader, Photon".